It’s difficult now to believe that such a fine building as the current Somerset House was built as government offices, but it was built in the days when government offices were important places of patronage and organisation. The Admiralty and Navy Board occupied it, as did the General Registry Office ( the precursor of the Public Records Office ) and the Inland Revenue. I can remember saying to a civil servant colleague, back in the ’90s, that in Paris or Rome such a fine central courtyard would be a cafe-sided venue for music and arts performances, not a car park. ( It really had used to be a car park, I’ve parked there. ) Now it has dancing fountains in Summer and a public ice-rink in Winter and hosts Summer Screen, a series of films and live broadcasts from London’s Opera Houses and theatres, as well as music concerts. It isn’t the oldest office block I’ve visited, that is probably the remains of the Basilica Julia in the ancient Forum in Rome. And the Uffizi in Florence is, arguably, better decorated, but it too was built to house offices. Like the Florentine building Somerset House has become a wonderful venue for exhibitions and performances, or just for visiting, sitting, eating and drinking in the several bars and cafes. It’s now easy and enjoyable to spend a whole day here and it’s very worth a visit. The site between the Strand and the river was popular for the mansions of the aristocracy as early as the medieval period, with John of Gaunt’s famous Savoy Palace slightly to the west of where Somerset House now stands. The original Somerset House, dating from 1547, was built for Edward Seymour, Lord Protector of England during the minority of his nephew, King Edward VI ( he appears elsewhere on this web-site – see Visit to Hertford House ). As Duke of Somerset, he owned this piece of land and made himself very unpopular when he cleared it of all buildings in order to build his great mansion there. This eventually cost him a spell in the Tower, but he survived and returned to his post. He didn’t last long, however, and was eventually beheaded on Tower Hill in 1552. The Palace subsequently became the home of various Queens. Anne of Denmark, wife of James I & VI, Henrietta Maria, wife of Charles I and Catherine of Braganza all lived here. But by 1775 it had fallen into disrepair and its demolition was followed by the construction of the current building by Sir William Chambers. It was finally opened in 1801. 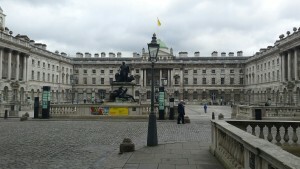 The Royal Academy, the Royal Society and the Society of Antiquaries were some of the first tenants. It was suitably grand accommodation for what were relatively new, but already influential, organisations. Kings College was granted the site to the immediate east of the House and its building was constructed so as to continue the main building and New Wing was opened to the west in 1856, after the construction of Waterloo Bridge. Thus the building that we see today. 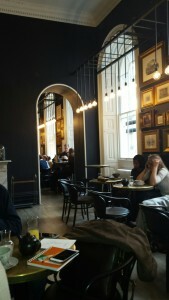 There are now restaurants and cafes a-plenty, including Pennethorne’s in New Wing where we ate lunch ( see left, below ). My companion had an office where this cafe/dining room now stands and I can recall attending meetings in these rooms, overlooking Waterloo Place It was an interesting experience (and the food was good). Incidentally, James Pennethorne was New Wing’s architect. There is the Courtauld collection in the North Wing, a sort of standing collection ( of which more in another post ) as well as historic rooms like the Seaman’s Hall and Navy Board rooms in the South Wing. Otherwise the space is dedicated to changing exhibitions. At the moment, aside from ‘By me, William Shakespeare’ in Kings College Indigo Rooms ( named for Indigo Jones, who renovated the place ), there is an exhibition celebrating the 500th anniversary of More’s ‘Utopia‘, one on ‘big data’, an Orthan Pamuk exhibition relating to his novel ‘The Museum of Innocence‘ and, from 19th to 23rd February, as part of London Fashion Week, the International Fashion Showcase. And, as they say, much, much more….. Some remnants of it’s history as offices survive. So the ‘back stairs’, not the grand circular staircases which are so fine, but the little ones along side them, have a bar across the stairwell at the top. 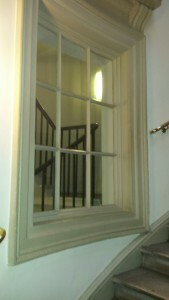 From this hung the hook and pulley used to hoist coals to the upper floors with which to heat the rooms of the civil servants in the days before central heating. And down in the subterranean levels there are, aside from the remains of a cemetery, the bricked up vaults, full of damp and ancient tax records, now abandoned to their fate. Free guided tours are available, the web-site has details. If you enjoyed reading this article you might also enjoy Lord Leighton’s House Visit to Hertford House Waterloo Undiscovered….